When political, economic and religious leaders no longer offer any solutions to the massive crises that confront us, it's time to re-imagine who we are as individuals and as a nation. 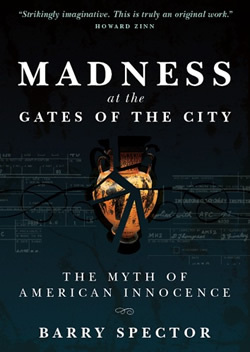 Madness at the Gates of the City: The Myth of American Innocence shows how America regularly re-enacts old patterns that cause us to subvert our goals, miss the deeper meaning in events and, perhaps, fail to prevent our headlong slide into cultural collapse. But by looking at our history, politics and popular culture through the lenses of Greek mythology, indigenous wisdom and archetypal psychology, Barry Spector discovers new hope in very old ways of thinking. To the Greeks, Dionysus was the god of paradox and extremes, of passion and masks, of ecstatic joy and vengeance, of tragic drama and of madness. But that was long ago. Or was it? After two millennia of Christianity and five hundred years of scientific rationalism, Dionysus and his modern substitutes persist in our imagination as images of “the Other.” He is everything that America has cast into the shadows: woman, race, nature and the body. The Other provides a unique window into American history, and especially our current political madness. This irrepressible aspect of both soul and society may re-emerge at any moment, bringing either mass chaos or longed-for healing. The choice is up to us, because Dionysus is part of us. Madness at the Gates of the City should appeal to anyone interested in myth, Classics, history, progressive politics or psychology. It will provide much new insight for people searching for new ways to understand how we behave in the world and what we might become. Barry Spector writes about American history and politics from the perspectives of myth, indigenous traditions and archetypal psychology. He has published three articles in Jung Journal: Culture and Psyche and is the author of Madness At The Gates Of The City: The Myth Of American Innocence (2010, Regent Press), which has received the PEN/Oakland 2011 Josephine Miles Literary award. In the late 1980s Barry began to participate in the mythopoetic men's movement. He has been involved with several men's groups and has attended the Mendocino Men's Conference regularly for twenty years. Recently, he became a staff member with the Redwood Men's Center in Santa Rosa, CA, and helped lead their annual men's conference. Barry and and his wife Maya were also part of an ongoing group for ten years in which men and women came together to heal the gaps and wounds between the genders. It was in the context of the men's conferences (led by Michael Meade, Robert Bly, Malidoma Some', Luis Rodriguez, Jack Kornfield and others) that Barry found his enduring passions for mythology (especially Greek myth), storytelling, spoken poetry and ritual (especially in our current death-denying culture, the need for rituals of public grieving). He can usually be found at San Francisco's Spiral Dance and Dia de los Muertes processions. The unique story of Barry and Maya's marriage has been featured in the book Secrets of Great Marriages: Real Truth from Real Couples about Lasting Love, by Charlie and Linda Bloom. Also, For over ten years, Barry and Maya have performed at The Great Night of Rumi, Rumi's Caravan and The Great Night of Soul Poetry, regular celebrations of recited poetry and music. Click here to hear them and others reciting poetry. These events, held in the San Francisco Bay Area, attract audiences in the hundreds. Although not a poet himself, Barry feels that the revival of spoken poetry and storytelling is a key to cultural renewal. He and Maya have been presenting Oral Traditions Poetry Salons at their home (the only rule is no reading!) for fifteen years. Over those same fifteen years they have been conducting an annual Day of the Dead grief ritual in early November. This is a full-day event that usually involves storytelling, poetry, small-group sharing, music, drumming and dance.